in 45 minutes i am off, an hour and a half road trip away from a weekend of sewing with some excellent companions (not to mention adult companionship, good food, wine, chocolate and SLEEP). i have about a million things to get finished this weekend, including the finishing up of my very first quilt pattern, the single sized sample is shown above. i find patterns a bit arduous, i like everything to be as clear as possible, which can be hard with just words and diagrams. luckily, i will have three sets of ears at the ready to lend a hand with the final touches - wish me luck! Lucky you - I must get to one, one of these years! Looking forward to seeing your wares! That quilt is simply gorgeous! Love, love, love. best wishes!! 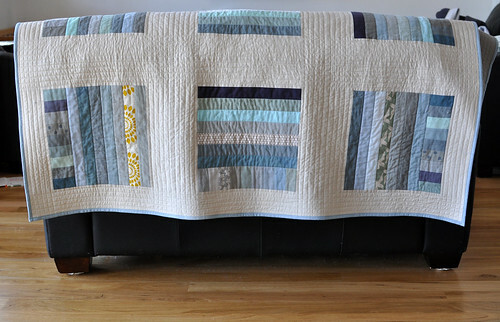 this quilt is stunning... i just found your work on flickr the other day and am amazed. i would love to learn more about the way in which you piece...! quilt is ridiculous. also, i found baby oobee don draper! yay! have a great weekend. SO JEALOUS.